HE IS FROM a village in Rohtak, Haryana, and she from Allahabad city, Uttar Pradesh. He is a first generation literate, who went to a Hindi-medium school, where classes were held under the trees. Her father was a member of the Rajya Sabha and a man of letters, who wrote many books including Village Panchayats in India and Land Reforms in India. His first language is Russian, and hers Spanish. Married for over 40 years now, they speak Spanish and Russian at home, along with Hindi and English. Meet professors Abhai and Vibha Maurya, a couple bound as much by language and letters as by love. 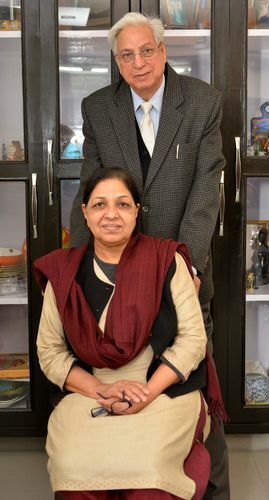 Abhai is founder and retired vice-chancellor of the Central University of English and Foreign Languages, Hyderabad, and Vibha retired as professor in the department of Germanic and Romance studies, Delhi University, last year. Vibha’s father was Harsh Deo Malaviya, a communist who had got disillusioned with the Quit India movement. He was adviser to E.M.S. Namboodiripad, the first chief minister of Kerala, but later joined the Congress and represented Uttar Pradesh in the Rajya Sabha from 1972 to 1978. Given this background, Vibha’s heroes of her early years were Fidel Castro and Che Guevara. Abhai’s background was a study in contrast to Vibha’s, and his life was also far removed from hers. A topper in class, Abhai was advised to become an engineer, by his teachers. But, because young Abhai played cricket, he had to skip classes. “You can learn a language on your own at home, but that is not true of maths,” says Abhai. “I always had a flair for languages and good expression. And, my parents could not afford to send me to an engineering college.” So, in 1965, he ran away to Delhi, which is not far from his village, and joined the Indo-Soviet Institute of Russian Studies that had just been set up in IIT Delhi. It offered him a scholarship of Rs 75 a month. The institute eventually became part of the new Jawaharlal Nehru University, and his batch was the first to graduate from the new university in 1969. His degree number was 01, making him literally JNU’s first alumnus. Abhai went on to do his PhD, after which he got a fellowship to study at the Maurice Thorez Institute in Moscow, where he met Vibha. When Vibha returned to India in 1976, there were posts for Spanish teachers in Delhi University and the JNU. She applied for both, and was the only qualified candidate. Both accepted her, she joined the JNU, and worked there for two and a half years. That was when she and Abhai got married. She later moved to Delhi University. Abhai joined Delhi University’s department of modern European languages, and soon became its head. “We started the MPhil programme first, taking in students who had done masters in English, and then came down to other degrees in Russian,” says Abhai. He taught Russian until his retirement in 2010. Vibha had taught Spanish for 41 years. When she started out, they had a one-year certificate course in Spanish. Now, the DU offers BA, MA, MPhil and PhD in Spanish. She was the only teacher then, now there are nine of them. “My association with the language has been for more than half a century now. I don’t know whether I speak better English or better Spanish,” says Vibha, who did her PhD in 19th century Latin American literature and Spanish from Havana, Cuba, in 1984-86. Vibha is proud to be a Hispanist, and is a member of the Spanish Royal Academy. “There are 23 countries in the world where Spanish is the first language,” she points out. “English is the most spoken language, but Spanish is the mother tongue of the largest number of people in the world.” Vibha has also translated the Spanish masterpiece Don Quixote into Hindi. The Mauryas’ daughter Anubhuti also reads, writes and speaks a foreign language. A teacher of medieval history at the JNU, she did her PhD on medieval Kashmir, and learnt Persian. Anubhuti studied Spanish while in school. Few know that Vibha was involved in the introduction of Spanish in the CBSE curriculum. Anubhuti learnt to speak Spanish when she would go with her mother on her teaching assignments in Spain and Latin America. Abhai, who was awarded the A.S. Pushkin Medal, the highest honour in the field of Russian language and literature, is also author of the Russian-English-Hindi Essential Dictionary. It is 800 pages of root-based entry, published in 2007. Among many other published works of his is a book on comparative literature, which is the main textbook of Russian, all over India. “Compiling dictionaries is donkey work. Writing a novel is a six-month process, but dictionaries take eight to ten years,” says Abhai, whose work on the 1,900-page Parable International English-Hindi Dictionary began in 2008 and ended in 2017. Why the dictionary? His reply is a telling comment. When he looked up an English-to-Hindi dictionary as a student in a Hindi-medium school, the Hindi equivalent of the English word was more difficult than the English one. “Therefore, to show a mirror to Hindiwalas that a lot of work needs to be done, I did this dictionary,” he says. His aim was to keep the Hindi equivalents simple.